This important collection of essays examines the history and impact of the abolition of the slave trade and slavery in the Indian Ocean World, a region stretching from Southern and Eastern Africa to the Middle East, India, Southeast Asia and the Far East. Slavery studies have traditionally concentrated on the Atlantic slave trade and slavery in the Americas. In comparison, the Indian Ocean World slave trade has been little explored, although it started some 3,500 years before the Atlantic slave trade and persists to the present day. 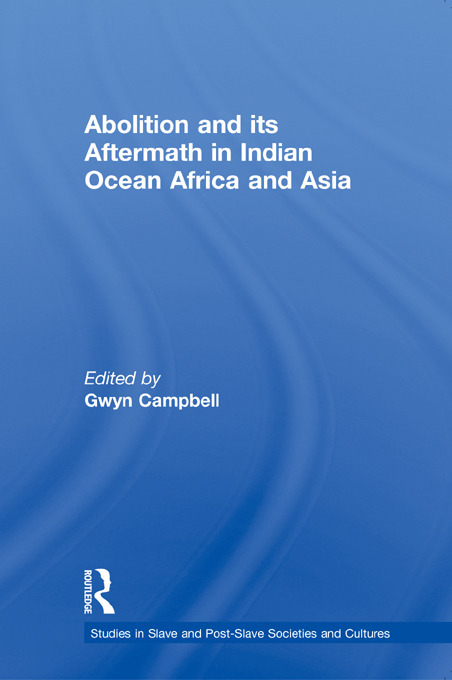 This volume, which follows a collection of essays The Structure of Slavery in Indian Ocean Africa and Asia (Frank Cass, 2004), examines the various abolitionist impulses, indigenous and European, in the Indian Ocean World during the nineteenth and twentieth centuries. It assesses their efficacy within a context of a growing demand for labour resulting from an expanding international economy and European colonisation. The essays show that in applying definitions of slavery derived from the American model, European agents in the region failed to detect or deliberately ignored other forms of slavery, and as a result the abolitionist impulse was only partly successful with the slave trade still continuing today in many parts of the Indian Ocean World.